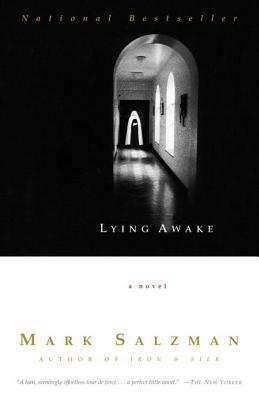 Mark Salzman's Lying Awake is a finely wrought gem that plumbs the depths of one woman's soul, and in so doing raises salient questions about the power-and price-of faith. Sister John's cloistered life of peace and prayer has been electrified by ever more frequent visions of God's radiance, leading her toward a deep religious ecstasy. Her life and writings have become examples of devotion. Yet her visions are accompanied by shattering headaches that compel Sister John to seek medical help. When her doctor tells her an illness may be responsible for her gift, Sister John faces a wrenching choice: to risk her intimate glimpses of the divine in favor of a cure, or to continue her visions with the knowledge that they might be false-and might even cost her her life. Mark Salzman is the author of Iron & Silk, Lost in Place, and the previous novels The Laughing Sutra and The Soloist. He lives in Los Angeles. "A lean, seemingly effortless tour de force...a perfect little novel." "Spare, luminous...Salzman makes this cloistered society not only believable, but also compelling." "A singularly rich and abundant work.... [Salzman has an] ability to convey spiritual states with a lambent clarity." "A satisfying and evocative questioning of faith and art." "Mark Salzman is...a poet, capturing in the pages of Lying Awake, his shining novel about devotion and doubt, a mysticism that reaches back in time to an older tradition, yet dwells easily in the present." "A gentle story.... Graceful, lucid and enjoyable." "Elegant.... Salzman's depiction of Sister John's conflict, convent life and this society of devoted women is a marvelous accomplishment." "Lying Awake showcases an almost ethereal talent, one that can handle complex ideas with a touch lighter than air."